Is Randall Cobb undervalued this season? 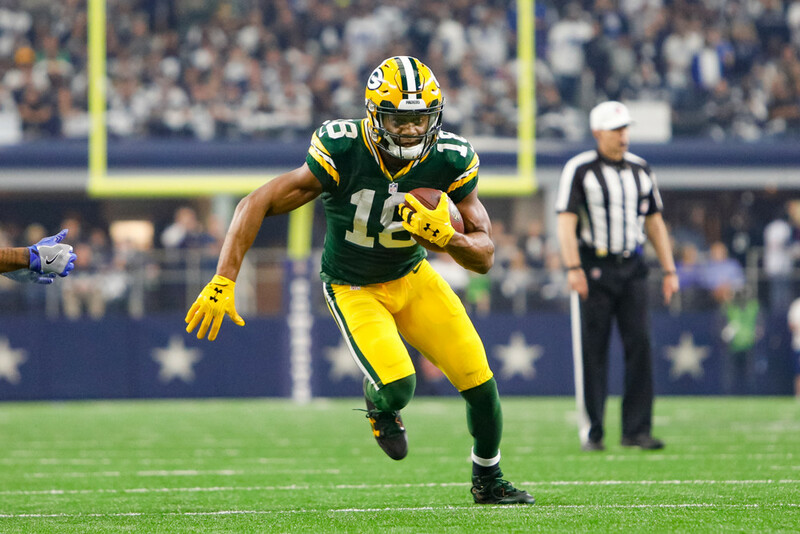 Green Bay Packers’ Randall Cobb wasn’t very healthy last year, which resulted in the receiver only hauling in 60 receptions for 610 yards and 4 touchdowns. He also ran the ball for 33 yards on 10 carries and failed to score on the ground. In standard scoring leagues, Cobb finished as the 58th ranked wide receiver, while in PPR leagues he finished 52nd. This was devestating for owners who selected him with a late third/early fourth round pick last year -- Cobb was the 18th wide receiver chosen off draft boards per his 2016 ADP. Those who drafted him were burned and the recency bias has left owners looking elsewhere on draft day. 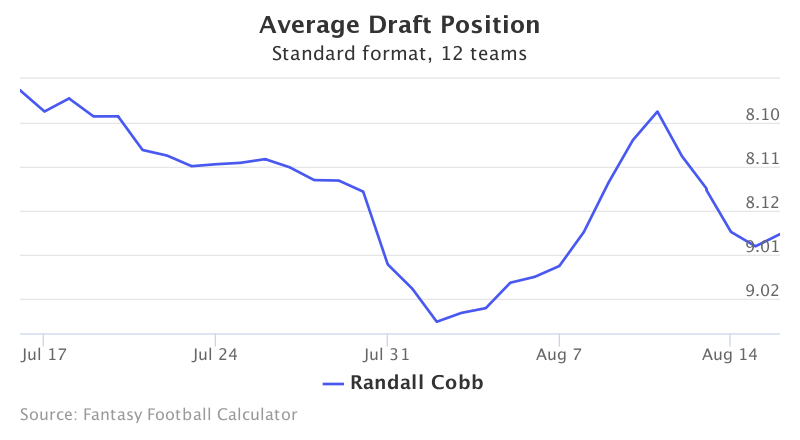 Cobb is currently being drafted as the 40th wide receiver being taken at 9.01 overall in fantasy football ADP. Data is from 12-team standard mock drafts. Over the past month Cobb’s ADP has dropped only a few spots, but will remain a late 8th, early 9th round come draft day. This assumes teammates Jordy Nelson and Davante Adams, who currently have ADPs of 1.12 and 4.09, respectively, remain healthy. Cobb would become a lock for top 20 WR if one of the aforementioned were to get injured. This past year Cobb got off to a booming start, receiving 51 targets over his first 6 games and averaged 15.6 fantasy points during that span. Cobb then injured his hamstring and sat out Week 8. He was never the same after that, and averaged less than 70% of snaps moving forward. To make things worse, Cobb then injured his ankle, which limited his ability throughout the rest of the regular season. From Week 9 onwards, he only saw 10.9% market share, compared with the 21.5% he saw in his first 7 weeks of the year. With Cobb sitting out the last two weeks of the season, he was able to rest for the playoffs, and had himself a good postseason. In the three games the Packers played, he had 18 receptions for 260 yards and scored 3 touchdowns. At his current ADP of 9.01, Cobb presents sneaky value. When healthy, he’s a consistently relied upon piece in a high-scoring Packers’ offense. While there is a chance Adams overtakes Cobb as the WR2, selecting Cobb as your WR4/5 is worth a flier with the potential to have a top 20 WR if an injury strikes, or if Rogers decides to feed him as seen in past seasons.